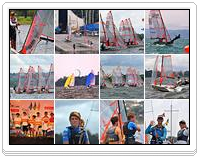 ​The Brazilian 29er Class and the Iate Clube do Rio de Janeiro (ICRJ) invites the sailors to participate in the 2019 29er South American Championship that will be held from April 15 to 21, 2019 in Rio de Janeiro – Brazil. The Yacht Club of Rio de Janeiro (ICRJ), founded in 1920, is a traditional club in Brazil. It is located in the beautiful Botafogo Cove within Guanabara Bay.